As we enter a new age in which traditional forms of music have meshed into an indistinguishable mosaic of sound and melody, the purest forms of music have seemingly fallen to the wayside. Everything with conventional notes and instrumentation is now called "jazz." "Rock ’n’ roll" is now anything with a guitar riff. Any black singer belting out earnest lyrics is now classified as R&B—even if he or she possesses neither rhythm nor the blues. Perhaps the most tragic but least-talked-about loss in the arena of disappearing categories is the time-honored tradition of church music. I am not referring to gospel music. Gospel music is any form of music that refers to religion and Jesus. It has been modernized and bastardized so much that it has become almost identical to secular music. I remember watching the BET Awards and commenting to my friend about the new R&B singing duo who were "thick and fine as hell … " I almost had to repent when he told me it was Mary Mary. It's not my fault. I bet there is someone right now making love to a playlist with R. Kelly's “Bump n’ Grind” right next to Yolanda Adams' “Open My Heart.” I won't even delve into "trap gospel" or gospel rap. Call me old-fashioned, but I don't believe I should have the urge to do the Nae Nae while the ushers raise the offering. One day Kirk Franklin will get caught up in a performance and tell the congregation to "put your hands in the motherf—king air for Jesus" and you'll remember that I told you so. The beginning: Congregational songs are passed down through history by … I don't know … osmosis. If someone starts a congregational song and you've logged as many church hours as I have, you somehow just know it. They all start with a simple premise, like, “Jesus is a way-maker. One day he made a way for me.” I know that sounds easy and uncomplicated, but that is only the opening aria of the congregational-song symphony. The middle: This is where you find out that not only is Jesus a way-maker, but he's a heart fixer, a truth seeker and so much more. In fact, whoever is leading the song will definitely run out of adjectives for Jesus. Then "the Spirit" will lead them to just start making stuff up. The longer they sing, the more things Jesus will become: a sickness healer, a car cranker, a rent payer, a remote control finder … and don't act like Jesus isn't all these things. One day he found a remote for me. Shouting music is a subset within the genre of church music. It is impossible to fully explain shouting music, but imagine if a jazz quartet that also played bluegrass and polka music became simultaneously possessed by the ghosts of all the African ancestors who just wanted to dance one more time. That's what shouting music sounds like. If love looks like the sun rising, then the Holy Ghost sounds like shouting music. For years, anthropologists, religious scholars and behavioral psychologists have tried to answer this question: Does the Holy Ghost create shouting music, or does shouting music call the Holy Ghost? No one has ever satisfactorily answered the question, but there is a magical potion to shouting music. If you don't clap your hands and stomp your feet when you are in the presence of some real shouting music, you are dead inside. I cannot say for sure if God is real or not, or if there is a Messiah who will return to earth to save us all, but if there is—he will not descend from the sky to the sound of trumpets. When and if Jesus comes back, it will be to shouting music. Sister Wilma: Even if her name is different, every church has a sister Wilma. 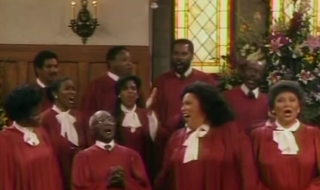 Sister Wilma was the Church Diva 30 years ago, but now she sounds like she’s been swallowing rocks, and her voice is so raspy it sounds like she needs to drink some lotion. She can't sing. But she can saaang. When Sister Wilma opens her mouth, it's like shining the Bat Symbol for the Holy Ghost. He's coming. Cue the shouting music. The Delusional Diva: Everyone has one of these people at their church, although it is not always a woman. There is always one person with an unshakable belief in his or her singing voice, even though that person sounds like that one time I stepped on my dog's testicles as I was holding him still while trying to clean his ears. Delusional Divas don't have the anointing. They can't call on the Holy Ghost. They are the source of all the choir conflict because they bring songs to the choir that the director gives to the Church Diva to lead. The keyboard player never knows what key they are singing in. But they never stop trying, because they love church music, and so should you. Jesus is a voice fixer. One day he fixed a voice for me.